1 Commercial Real Estate & Properties in Kremnos are listed in 1 categories. We have 1 Development LandsSale . 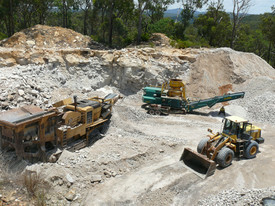 1,181 hectares of spectacular bushland on 5 titles 2 separate quarries with great potential for expansion High grade loose sand deposit with low sediment levels Huge untapped resource of quartz arenite and loose sand Quartz arenite for crushing for roadbase and block cutting High quality material with geotechnical information available Generous long term permits Extensive road network throughout property Quick access to sealed state road Close to future Coffs Harbour bypass project 35 minutes to Grafton, 40 minutes to Coffs Harbour Property also contains a wide variety of timber and bush rock Machinery not included approx Please contact the listing agent for more details by clicking on the link above. Disclaimer: Ray White has not independently checked any of the information we merely pass on. We make no comment on and give no warranty as to the accuracy of the information contained in this document which does not constitute all or any part of any offer or contract by the recipient. Prospective purchasers / lessees must rely on their own enquiries and should satisfy themselves as to the truth or accuracy of all information given by their own inspections, searches, inquiries, advices or as is otherwise necessary. No duty of care is assumed by Orchid Avenue Realty trading as Ray White Surfers Paradise Commercial divisions toward the recipient with regard to the use of this information and all information given is given without responsibility.